I began this series of posts with some information from the Southern Pacific prototype drawings for these set-off facilities (or turnouts. as SP called them) for track cars such as speeders. The core information was contained in drawing CS 551 (CS = Common Standard), and that drawing was included in the post (see that description at: https://modelingthesp.blogspot.com/2018/12/track-car-turnouts.html ). I followed that post up with two posts about modeling the turnouts, of which the most recent showed completed “panels,” and how I represented the scrap ties used as the wheel supports in the turnout. 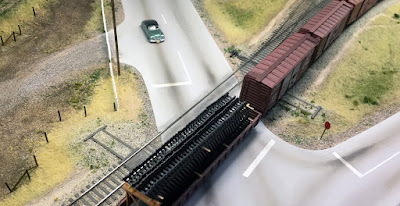 The more recent post is located at: https://modelingthesp.blogspot.com/2019/01/track-car-turnouts-part-3-modeling.html . To install these, I placed a blob of fine-grained Brandt’s Compound taxidermists’ paper-mache (for more about the product I use, see my earlier post here: https://modelingthesp.blogspot.com/2013/11/rebuilding-my-ocean-beach.html ), pressed the turnout panel atop it, and added more paper-mache to slope the outside of the platforms as shown in CS 551. Each of my three installations was different as to the amount of paper-mache needed to make a nearly level turnout panel. Here is one example. The panel between the rails, and the first timber outside the rails, are just lying in place and are not yet glued in their final location. Once the paper mache was fully dry, I added ballast or dirt (depending on the local track ballast look). 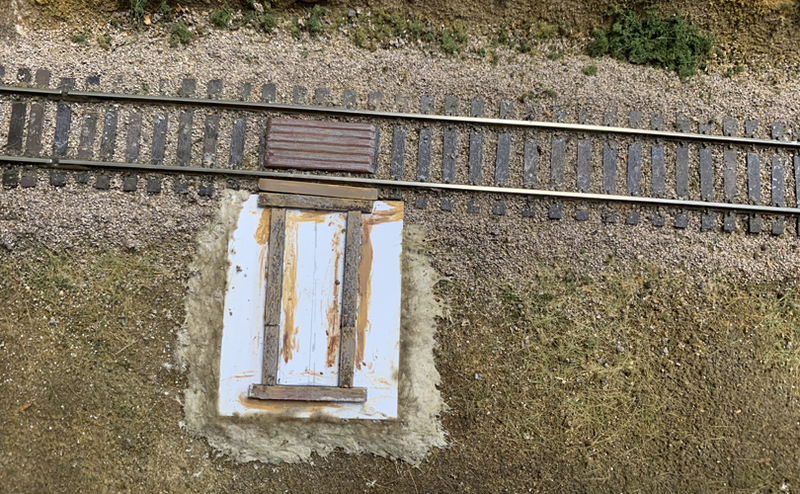 I did this by painting on some matte medium on the entire area to be ballasted, sprinkling on the ballast or dirt, misting with “wet” water, and using an eye dropper to place diluted matte medium throughout the added material. When completed, these looked pretty good (some grass and weeds around the edge will be added too). But I will admit that the final tie colorations needed to be different in each location. After installing each panel, I went back and darkened some of the tie material with dark gray paint, or adjusted color otherwise. 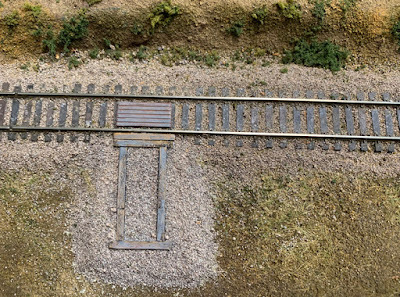 A fine example of how someone else installed these turnouts in completed form is shown in the photo below, from Paul Chandler’s excellent layout. 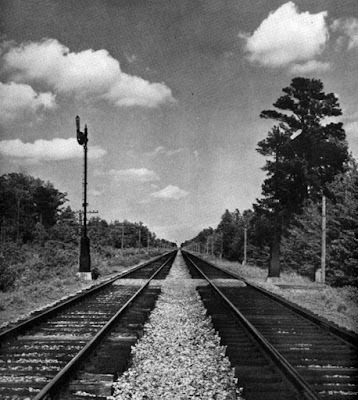 There is one on either side of the highway being crossed by the railroad. 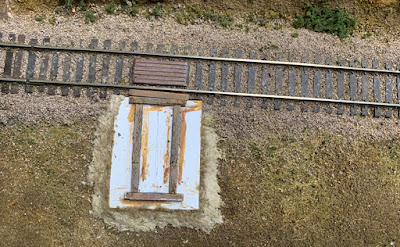 I showed another of his turnouts in an earlier post about a somewhat different topic, my experiences of learning from layout visits (you can find it at: https://modelingthesp.blogspot.com/2018/11/thoughts-on-visiting-layouts.html ). This completes my installation of these track-car turnouts on the layout. 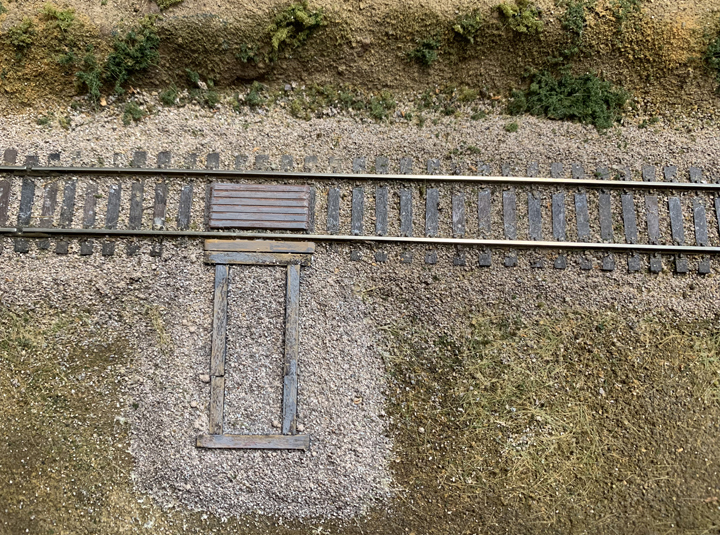 I like the look of these, and feel like they add to the realism of the track, even though they are a minor and passive element of the trackage.